Lexypexy - teether toys never looked so good! Lexypexy – teether toys never looked so good! Whoever said there was nothing to get excited about over baby teething toys obviously hasn’t encountered the ever so eco-chic, all natural and all fun Lexypexy teethers. Lexypexy is responsible for a collection of fabulously fun baby teethers. 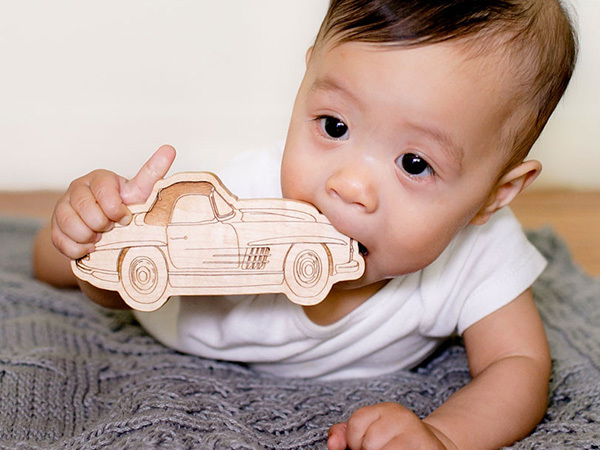 Babies can now munch down on an awesome range of front and back detailed wooden teethers, including bestsellers, a Chanel-esque handbag named The Ava and The Gavin – a delicious looking vintage car. There’s even a croissant, a fancy-schmancy yacht and a pair of Ray Ban lookalikes for babies with expensive tastes. Before you reel back in horror at the thought of your beautiful baby mouthing a piece of wood, be reassured Lexypexy teethers are made from all natural Maple wood, which is rock hard, has natural antibacterial properties and won’t splint, no matter how long tiny toothy pegs gnaw away at it. Shop for these gorgeous teether toys direct at Lexypexy, they’re all priced US$25 and can be shipped to Australia.